Miss Maribou. 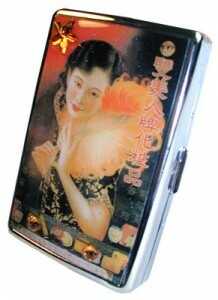 Asian beauty adorned with feathers on a wallet case with one clip inside. 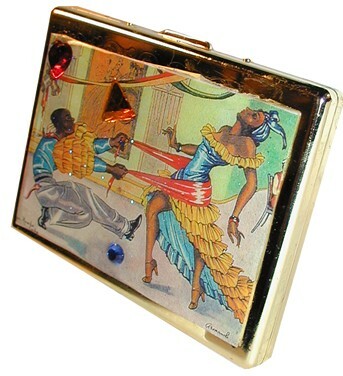 Perfect for carrying cards, money, cigarettes,condoms, receipts. CHIC COFFEE: Groovy image of Pam Grier in 1970’s sultry icon mode on business card holder with a silver finish. 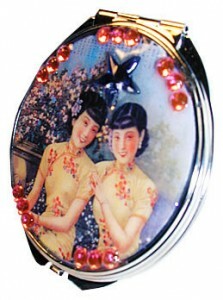 Embellished with mulit-color crystal borders. 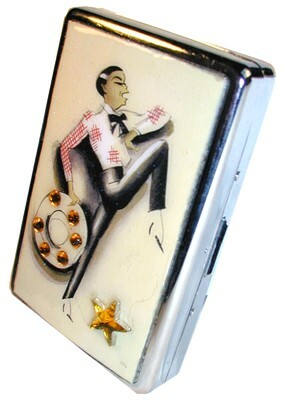 Bolero Dancer Case This 1920’s cool cat strikes an elegant dance pose on art case that can be used forcigarettes, mints, cards, money clip. Silver finish. COWGIRL Hot pin-up girl in ranch gear on silver finish collectible cigarette case. CUSHY PUG PILLBOX This cushy pug is no thug; just check out his tiara. Silver pillbox with mirror inside. Also available in business card holder. silver finish. CHINESE GARDEN. Vintage image of two Chinese twins amidst floral beauty on a round silver mirror compact. Embellished with pink rhinestones. BEAUTY AT THE BEACH. 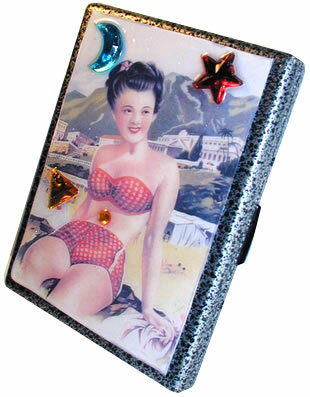 Vintage Asian beauty pin-up girl is getting her bikini groove on. On a flat wallet-size case with a silver finish. 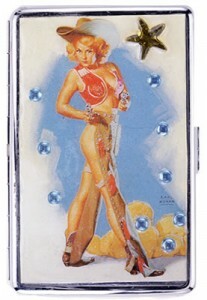 Embellished with red, blue rhinestones plus a yellow one in her belly button. GAY PAREE. Classic dame a la Mistinguett French style from the 1920’s. 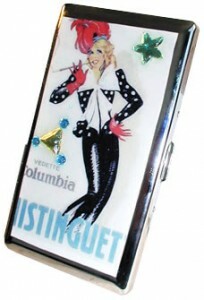 On a long silver vanity case which contains a mirror and clip that’s perfect for holding tissues, long cigarettes or cards and money. CUBAN WINNER. 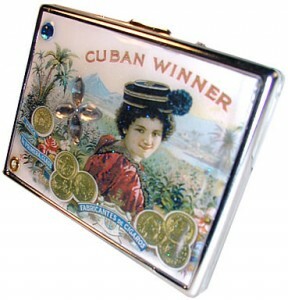 Vintage Cuban cigar graphics make this flat silver wallet case a winner.